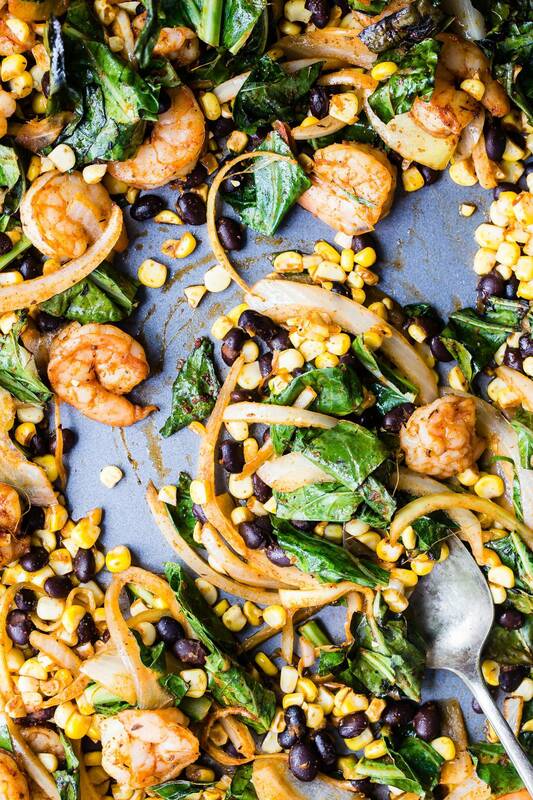 Throw everything on your sheet pan and bake it in the oven. No mess and no fuss! One pan dinners are all the rage right now, because who wants to deal with dirty pots and pans filling up the sink on a busy weeknight? 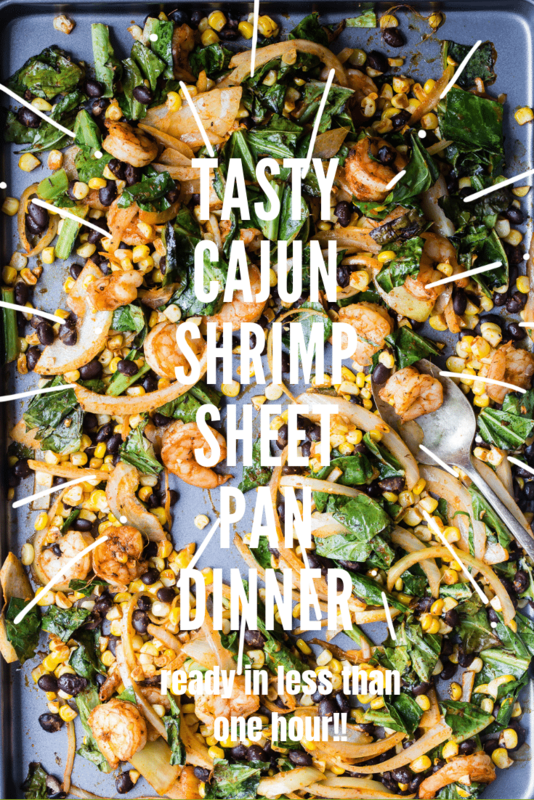 Just by throwing everything on a large sheet pan we can eliminate all of the cleanup hassles but still have a well-balanced family dinner! 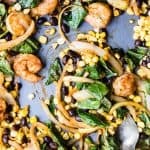 I’ve seen so many options for sheet pan dinners but I haven’t seen many that use shrimp, so check out how easy it can be to make this Cajun Shrimp with collard greens, corn, and black beans. Cajun recipes can be spicy and this one is no exception but if you dial back the Cajun spice, you’ll end up with a much milder level of heat. Is there a certain order to cook the ingredients? Obviously, lots of ingredients cook at different times from each other. Size, thickness, and density can all play a big part on how long something will take to fully cook. An important thing to remember when your cooking a sheet pan dinner is to make sure all of the ingredients are close to being the same size and can cook fairly quickly. If you’re using chicken it might be a good idea to use tenders or if the recipe calls for chicken breasts, pound them with a rolling pin so they’re thinner. If steak is called for, then skirt steak or flank steak would probably be a good choice. Will my Cajun shrimp be overcooked? These Cajun shrimp don’t take long to cook but they definitely don’t cook as fast as searing them in a wok or a pan. They’ll need a few turns during baking to ensure even cooking. I didn’t find them overcooked at all, even the collard greens which are pretty hearty had wilted perfectly and weren’t soggy like how spinach might be. If you look at the rest of the ingredients, collard greens, onion, corn, and beans, none of them need major cooking. So once the shrimp are ready you’re good to go with everything else. Can I make my Cajun shrimp less spicy? I used one tablespoon of this Cajun spice for one pound of shrimp and it was perfect for my taste. On a heat level of where 10 is hot, I’d say it was a six. You could easily cut back on the spice if you prefer a milder flavor but that Cajun flavor is amazing! What’s the best shrimp to use? I recommend using large shrimp which are usually 31-40 per pound. 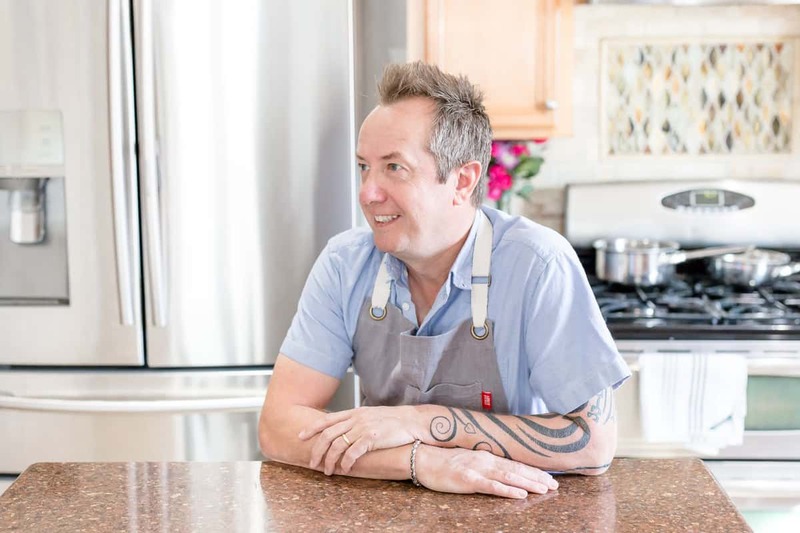 anything smaller will cook quicker and eventually run the risk of being overcooked. The larger the better in my opinion and no pre-cooked pink shrimp. I like to use shrimp with no shells just so the flavor really gets into the shrimp, and they’re just way easier to eat. If I was at a crab boil then definitely shells on, because the whole fun part of a crab or seafood boil is to get stuck in with your fingers! I think if you can reliably source fresh shrimp then go with those, but frozen is also a fantastic option. Just make sure that the ingredients on the bag just say shrimp. You’d be surprised at what else you might see in the way of preservatives. Check out my seared scallops post for more information on fresh seafood. 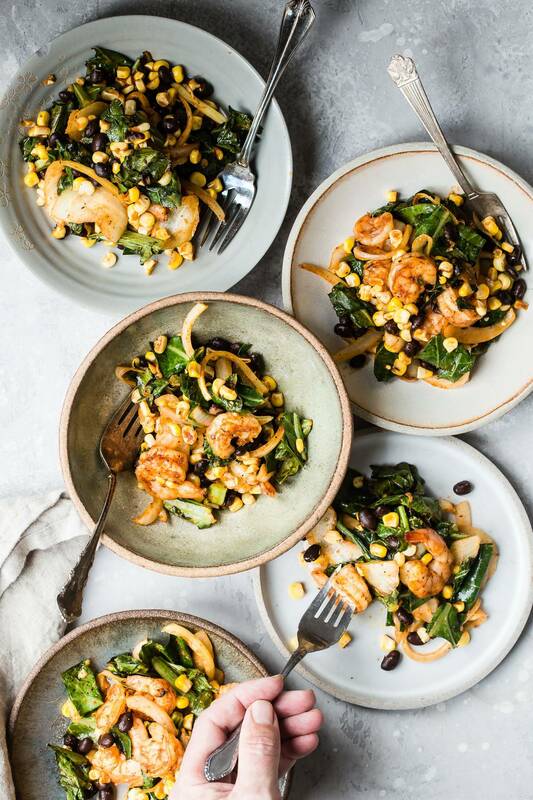 To thaw frozen shrimp, just place them in a bowl and fill with cold water, change the water every 15 minutes until they are thawed, which happens quickly. After they’re thawed, dump the water and keep them in the bowl with a paper towel over them in the refrigerator until needed. Check out these other seafood recipes I think you’ll love! 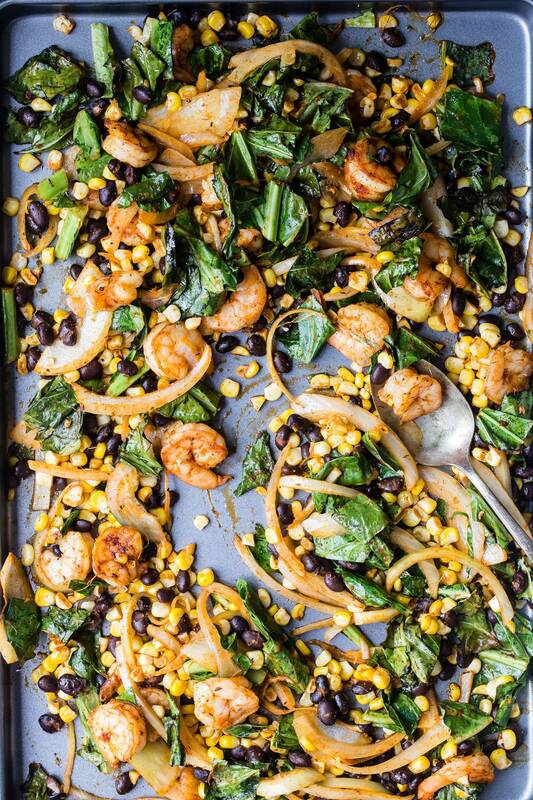 A super tasty sheet pan dinner for the family, loaded with juicy Cajun Shrimp, black beans, onions, corn, and collard greens! No mess and no fuss, this is a winner! In a large bowl add the shrimp. 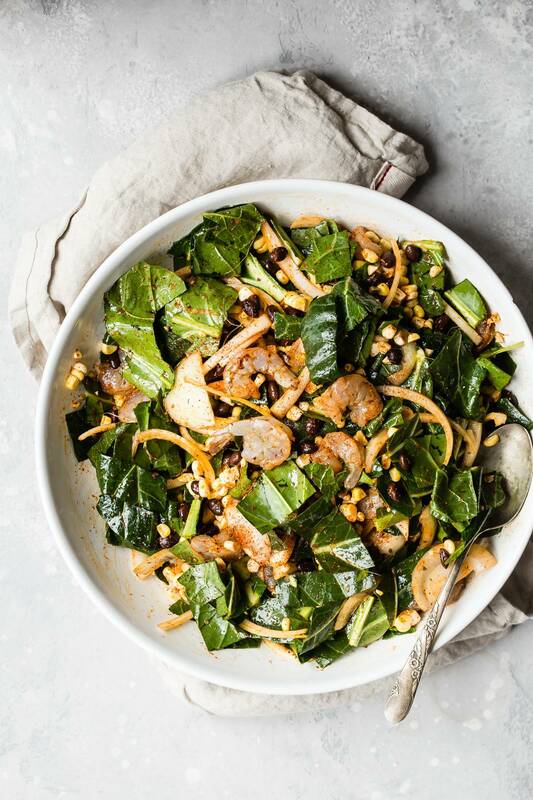 Trim the stems from the collard greens and roughly chop the leaves into small squares and add to the shrimp. Slice down the corn to take away the kernels throwing away the cob part. Transfer all of the corn kernels to the bowl. Add the onion, beans, Cajun spice rub and olive oil to the shrimp bowl and toss well to coat everything. Carefully dump everything from the bowl onto your large sheet pan and spread out evenly. Bake in the oven for about 20 minutes making sure to give everything a shake with some tongs about halfway through cooking. Season with salt and black pepper when done and serve immediately in bowls or with a side of brown rice. Bring on the spicy shrimp! !